I have been using this toothpaste twice a day for a week now (and also used my sample from Carmine for a week - so 2 weeks in total). I am amazed at the difference already, I used to have a stain in between two of my teeth at the side and this has faded by 50% already, I have hated this stain for such a long time and used to scrub at it with those mini toothbrushes (silly I know) and nothing has even made it fade! 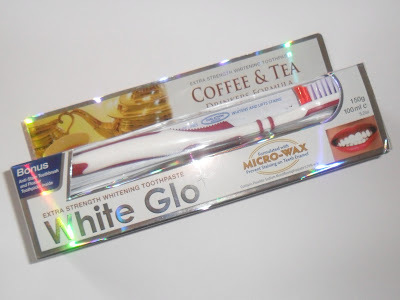 For £4.07, with toothbrush and special toothpick, I think this is a product definitely worth having in your bathroom cabinet! They do come with different names for example: extra whitening, tea and coffee drinker, smoker etc, I couldn't tell the difference in taste from the one I have (Tea and coffee drinker) to the sample I got in Carmine, which I think was the original, but my boyfriend said he could taste a difference? Just to point out I am in no way sponsored to do this post I genuinely love the product and thought I would pass on my find to you all. Oh I might have to pick one of these up. I am sooo glad I got a sample in Carmine as I love it so much! Wow, I'm going to give it a go!